True story- if I could pick just ONE food to live off forever, and never get tired of it, and also never worry about how it would affect my health, it would be FRENCH FRIES! Anyone else with me? I love potatoes, love the crunch and even the salty/sweetness. I'm not big on the dipping sauces, but that's for another time. I've been on the search for some way to feel strong about honoring foods that I love, without worrying how processed most French fries are! So, there we have it- homemade French fries. Sometimes I use Japanese Sweet Potatoes, but when I went to Trader Joe's they only had sweet potatoes, so I said why not?! I like to buy smaller potatoes so they are easier to cut (big time-saver)! You literally cut, toss, spread 'em on a sheet and just wait. Let me just add, waiting for these babies to cook is the most difficult part of this recipe. Check out the deets for the goods below. Cooking oil of choice (I use Coconut oil due to higher boiling point) about 2 tbsp. 2) Trim the edges and cut potatoes into slices. Throw the potatoes into a large mixing bowl. 3) Melt coconut oil for about 25-30 seconds. 4) Pour coconut oil over potatoes and season with a pinch of sea salt and nutritional yeast. 5) Roast in a skillet on high heat for 4 minutes until the potatoes begin to brown. 6) Transfer potatoes to a cooking sheet and cook on 425 for 40 minutes. 7) Set your oven to a high broil temperature for 3 minutes. 8) Take out of the oven, let cool, top with another pinch of sea salt and nutritional yeast. 9) Attempt not to eat all in one sitting!!! Snap a picture of your fries and let me know how they turn out! Tag me on IG @Lindsey_g_yogi. Love the thought of dessert, but hate the idea of the endless of ingredients, the clean up, the time that it takes to bake, and then the QUICKNESS that it is all gone? Here is a solution for all of the issues listed above, with the exception that I can't promise these will stick around your kitchen for too long! These paleo, gluten-free, dairy-free, soy-free, refined sugar free treats are bite size and delicious, but I'll let you make the final call. 1) Take a knife and thinly slice one side of your date to squeeze out the pit. Complete on all dates. 2) Add a spoonful of almond butter inside each of the dates. Put the dates in the freezer for about 15 minutes to let them harden. 3) Melt Dark chocolate and coconut oil either over the stove top or in the microwave, being mindful not to burn the chocolate (If in the microwave I suggest in 30 second intervals) and stir before putting it back in the microwave. 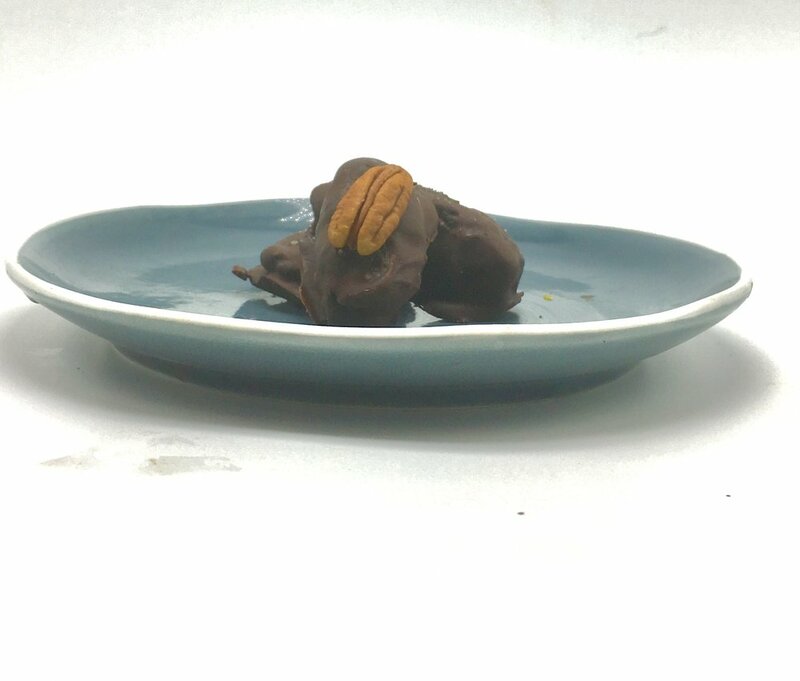 4) Dip each date in the chocolate using a spoon to help cover the date completely. 5) Place on parchment paper and put the in the refrigerator or the freezer in a Tupperware! 6) Let me know what toppings you chose and how things turned out. P.S. want to know more about the healthy effects of dates? Click here to read more. You had me at Pumpkins Spi…. No no, Starbucks, that’s not what I’m getting at here!I I mean 100% Pumpkin (organic if possible). Besides the fall coloring of pumpkin, eating pumpkin, can aid with sleep, help protect your heart (beta-carotene), and make you feel full. Pumpkins are full of beta-carotene, part of what gives pumpkins their orange color (similar to carrots). Beta-Carotene is a highly powerful antioxidant that is converted into Vitamin A in our bodies, meaning it can help with asthma as well as our vision. Plus, did you know you can substitute pumpkin pie filling in for butter or oil in desserts? Here is a favorite pumpkin recipe of my own , or check out MY version of a pumpkin spiced latte on the blog JBOO! As the air becomes chillier and crisper, my body craves savory foods. Yet, I still find myself wanting something sweet because hey that’s me! For so long, with the fall air came INTENSE CRAVINGS of processed sugars (you know candy corn, 3 musketeers, peanut butter m&ms), and my October-January was all down-hill. But then, I realized, if I indulged in warmer savory foods (roasted potatoes, avocadoes, chia seed pudding) with a bit of GOOD fat, I am completely satisfied with what’s on my plate, and my sugar cravings almost completely disappeared. Delicata squash is fun in color, and even MORE fun to cook, did I mention EASY? Some squashes, like Spaghetti and Butternut Squash are super tasty but by the time I cut through the squash, I’m exhausted, and starving! You just cut your delicate in half lengthwise, scoop out the seeds (keep the seeds if you want, but that’s for a later talk) toss in some melted coconut oil and spices, and boom roast in the oven. Plus, it is high in Vitamin A and C, is low in carbohydrates, and can be easily spiralized into noodles! I recently picked up our CSA Farm share and discovered these sweet little brownish-apple-shaped fruits that were NOT apples. 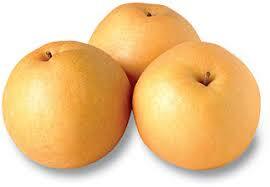 They are Japanese pears- high in nutrient value (Vitamin K and C) potassium, fiber, and flavor, AND low in calories. These pears give a nice sweet crisp to any salad (have you checked out my blog post about it? Just sub in the pears for apples)! What are some of your favorite go-to Fall items? I can’t wait to hear what works for you and your body! Who said snacking had to be boring and full of empty calories? Here's one of my favorite super food packed, healthy snack that is easy to keep up with when you are always on the go (hehe, how I feel so much of the time!). 1) Melt Coconut oil to a liquid form. 4) Pour liquid mixture on top of nuts, close the bag, shake it up. Like this recipe? Take a photo, tag me on IG @Lindsey_g_yogi - can't wait to hear how it goes!